At the risk of vilification by my peers, I’m going to say something extremely unpopular. We physicians have it pretty good financially. Our salaries are generous, and we have a much higher standard of living than most others in America. When I read online physician complaints about student loan debt, I cringe a bit. Because of all the people in debt, we are some of the most likely to be able to pay it down quickly. Medical school and residency are emotionally, mentally, and physically exhausting. There is no doubt that we are severely cash-strapped during those years, and yearn for the day when we can go out to a nice restaurant and order anything we want from the menu. Most of us are eager to splurge on ourselves the minute we get our first job, and do not think about loan repayment. However, the truth is that if we gutted it out (living “like a resident”) for a mere 2 more years, most of us could pay off our student loans completely. Let’s say we have an annual salary of about $200K and a student loan debt of about the same. What is the average household income in America? About 51K? Maybe if we lived on that amount for 2 years, and put all the rest (after taxes) into our loans – we’d be debt free. I feel worried for young Americans who have a similar total student loan debt as physicians, but graduate with much lower earning potential. 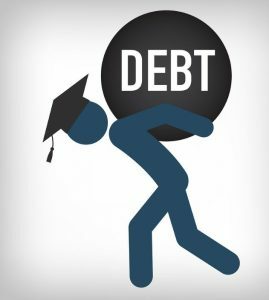 Students should soberly consider educational debt against their likely ability to repay it. We must all choose our education wisely, as it may have life-long consequences for our standard of living. Physicians have many legitimate gripes, student loan debt (in my view) is not one of them. In reviewing Ezekiel Emanuel’s New York Times article I thought of an interesting question. In Dr. Emanuel’s view it is not worth having tort reform or healthcare care insurance reform. He claims these reforms are an insignificant burden to the cost of the healthcare system. I have demonstrated that the evidence for tort reform and reform of the healthcare insurance industry proves him wrong. The question then is where is the $2.5 trillion dollars the U.S. healthcare system spends going? President Obama and Dr. Emanuel think it is going to physicians. President Obama’s idea to control healthcare costs is to reduce physician reimbursement. Physicians have the weakest expression of its vested interests among all the stakeholders because of lack of effective leadership. Simple arithmetic reveals that reducing physician reimbursement will yield an insignificant reduction in healthcare costs. Never the less on January 1st Medicare is going to decrease physicians’ reimbursement by 27%. This decrease is the result of the application of the government’s Sustainable Growth Rate (SGR). Academic faculty physicians in primary and specialty care reported slight pay increases, according to the Medical Group Management Association. The organization’s Academic Practice Compensation and Production Survey for Faculty and Management: 2011 Report Based on 2010 Data, annual compensation for internal medicine primary care faculty physicians increased by 6.84% since 2009, and increased 4.46% between 2008 and 2009. Median compensation for all primary care faculty physicians was $163,704, an increase of 3.47% since 2009, and median compensation for specialty care faculty was $241,959, an increase of 2.7% since 2009. It’s only a matter of time before female physicians outnumber men, say medical school heads who are seeing more women in their programs. Although women have broken the gender barrier in medicine, they may want to keep going into nursing, because nurse practitioner salaries grew faster than primary care physicians’ pay — nearly 5 percent compared to nearly 3 percent. With medical students graduating, on average, with almost $160,000 of debt, it’s a major reason why they’re choosing more lucrative specialty practice, which can offer salaries multiple times more than those of primary care fields. In this clip from The Vanishing Oath, medical economist Amitabh Chandra, Professor of Public Policy at the Harvard Kennedy School of Government, discusses that influence, which contributes to a drastic decline of primary care residency slots being filled by American medical graduates. Of course, it’s not only money. Primary care practice has a litany of obstacles that can contribute to rapid physician burnout, compounded by the fact that good primary care role models are largely absent from academic settings. But there’s no denying that the salary disparity is an influential factor, and for many students, often a deciding one.